The Shippon at Lestitha Farm has undergone a complete refurbishment over the winter of 2014 / 2015 into a luxurious one bedroom holiday home. All on one level, the Shippon will be easily accessible for all and is designed to take in the extensive views over the rolling countryside. This is a brilliant place to stay for couples looking to escape to a peaceful rural location with beautiful views, yet within easy reach of many places to see. 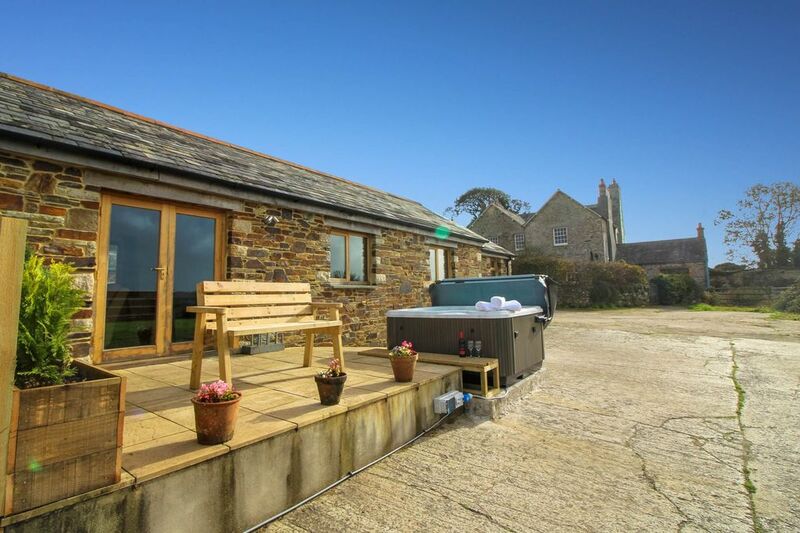 Lestitha Farm is located on the edge of Bodmin Moor, conveniently just 5 minutes drive off the main A38 dual carriageway at Liskeard. The south Cornish coast town of Looe is just 20 minutes away with nearby beaches. There are also extensive water sports at Siblyback Reservoir just 10 minutes away. The walking around Bodmin Moor is just superb and dogs will be in heaven! Wheel Barn is located next door and can accommodate 4 guests. This can be booked at the same time. The Owners are very welcoming and will provide lifts to the local pubs for evening meals upon request. Ground Floor: Entrance to the sitting room with the Master bedroom leading off. The bedroom has a 5' double bed. The sitting room has a flat screen TV, wood burner and glorious views over the rolling countryside. There is an en-suite bathroom with separate shower cubicle. Exterior: Garden with external furniture and a private hot tub. There is also a 2.5 acre enclosed paddock on the farm for exercising dogs. Heating is via central Biomass heating and the wood burning stove with ALL logs provided. The kitchen has a range of equipment. There is an electric oven & hob, microwave, kettle, toaster, fridge with ice box and dishwasher. A washer/dryer is available on request from the owner. The sitting room area has a flat screen, digital TV & DVD player. There is a private hot tub on the patio. WiFi is available at the property. There is an iron & ironing board available, on request from the owner. The property benefits from extra wide internal doors (2'9"). Electricity, heating, logs for the wood burning stove, bed linen and towels are all included, but you will need to provide your own beach towels. Up to 2 well behaved dogs will be permitted at the small additional cost of &pound;25 per dog / per week, but please remember that dogs cannot be left unattended at the property alone. There are parking facilities for at least 2 vehicles, plus more. Regrettable smoking is not permitted. There is a cot & high chair available. On request at the time of booking, a camp bed can be provided in the bedroom for a child under the age of 10. There will be an additional charge of &pound;25 per week for this which will include the provision of bedding, bed linen and towels. &pound;100 pre-authorised to your credit / debit card as a security deposit is required. We really enjoyed our stay at the Shippon, Rita was very accommodating and put up a surprise 50th birthday banner for my wife on arrival. The home made scones were lovely as well. Lovely cottage, very spacious and comfortable. Really enjoyed the luxury of the hot tub and the fresh baked scones on arrival were lovely. The hosts were extremely friendly and helpful. Thoroughly recommend. We had the most fantastic stay at the Shippon! So peaceful and relaxing! Was lovely to see our dog Paddy playing with their dog Bailey too! Rita couldn’t have been more helpful and her daughter. Will 100% be back again very soon! Well what can I say....our stay at The Shippon was amazing. Great area, the accommodation was fabulous and the stars in the sky were a sight to see. Thank you so much for a great escape from the rat race...truly a lovely place to be. The highest village in Cornwall is Minions which is a mere 4 miles from Lestitha Farm on the south east corner of Bodmin Moor, and has a wealth of ancient archeological sites dating from the early bronze age onwards and they are really popular with walkers and hikers, these include the Hurlers, three stone circles dated at around 1500 BC, a line through the centre of them brings you to Rillaton Barrow a large burial mound. Alternatively on the top of Stowes Hill, overlooking Minions, you can see the Cheesering, a natural formation of balancing stones formed during the last ice age and by thousands of years of erosion, the name derives from the shape of the stones and will become patently obvious on viewing! The ancient stannary town of Liskeard is at the head of the Looe Valley and is approximately 12 miles east of Bodmin. Liskeard is one of the few remaining towns in Cornwall to still have a livestock market. It serves a number of small surrounding villages and is the gateway to Bodmin Moor. Liskeard is also the starting point of the Liskeard to Looe railway, one of the most scenic railway trips in the country and a delightful day out! Bodmin Moor, bisected by the newly expanded A 30 is home to one of Cornwall's Areas of Oustanding Natural Beauty. Reaching a height of 1,377 feet above sea level at Brown Willy, Cornwall's highest point. The heather covered granite moorland provides East Cornwall with the most stunning country views and rugged walks. Near Blisland you will find two of Cornwall's stone circles, the Trippet Stones and Stripple Stone Henge and just round the corner, one end of the famous Camel Trail. The 18 mile Camel Trail follows the route of the old railway along traffic free paths, providing a fairly flat cycle through Bodmin and Wadebridge out to Padstow, eminently suitable for families. The National Lobster Hatchery at Padstow neighbours Rick Steins empire on the North Coast. The Bodmin and Wenford Railway, the first steam operated railway in Cornwall, takes in 13 miles of countryside. Also just outside Bodmin is the Camel Valley Vineyard who have been winning awards for their home grown wine for the past 20 years. The National Trust have a number of properties nearby - Lanhydrock House, Trerice, Cotehele and Antony (used for Disney's Alice in Wonderland), Carnewas and Bedruthan Steps. Slightly further afield is the Eden Project in St Austell. Bodmin Jail built in 1778, notorious for its public executions by hanging, was the first jail to be built housing inmates in individual cells. The Jail closed in 1927 and is now a museum open to the public, which during the First World War housed the Crown Jewels and the Doomsday Book. To the east is the Tamar Valley, a stunning, quiet, picturesque region with some beautiful villages including Calstock with its impressive Viaduct dominating the village, Calstock Quay was originally used for transportation of tin as there is a deep water navigable channel at the top of the tides, although the construction of the Tamar Valley Railway in the early 20th century led to most cargo being transported by rail. Further up stream is Morwellham Quay with its fantastic open air museum, Morwellham Quay has been awarded World Heritage Site status by UNESCO, the cultural arm of the UN, and is part of the Cornwall and West Devon Mining Landscape. Originally set up by the Benedictine Monks from Tavistock Abbey in 961 as a trading route to Plymouth via the Tamar. Tavistock is an ancient stannary and market town on the edge of Dartmoor and just across the border in Devon, it has a wealth of fine pubs, restaurants, supermarkets and tourist attractions. Heating, electricity, logs for the wood burning stove, bed linen and towels are all included, but you will need to provide your own beach towels.